It is difficult to reset the restriction passcode on the iPhone if you have forgotten the old passcode. Is it possible to bring back your restriction password without going to factory settings? This article helps the iPhone users to retrieve their forgotten restriction passcode and enable them to reset it without much difficulty. Different techniques were adopted to reset the restriction passcode on iPhone without restoring it. If the iPhone user remembers the restriction passcode then it is very simple to reset it. You do not need a computer to carry out this task. You can successfully reset it in your device itself. Step 1: Unlock your device and go to the ‘Settings’ option. Step 2: Click the ‘General’ menu from the expanded list. Step 3: Tap the ‘Restriction’ from the General menu and click the ‘Enable restriction’ feature. Step 4: Now enter the old passcode in its respective field and enter the new restriction passcode to carry out the reset process. Step 5: After the completion of reset process you can add the applications to this feature in order to restrict the entry. It serves as a parental control and prevents the children from entering into secure files in your device. You may not face any issues if you remember the passcode. Resetting process becomes very simple and you can easily achieve this task quickly within a flicker of an eye. By resetting your device to the factory settings, you can reset the restriction passcode even if you have forgotten it. The only disadvantage you will face in this process is that there will be a data loss. The stored data like pictures, videos, files etc will be automatically deleted when the device is restored to its factory settings. This setting will assign default value to all the features available in the device. Suppose, if you have forgotten your passcode, then you should perform a series of task to establish the resetting process. Here you are going to learn how to reset the restriction passcode without any data loss. 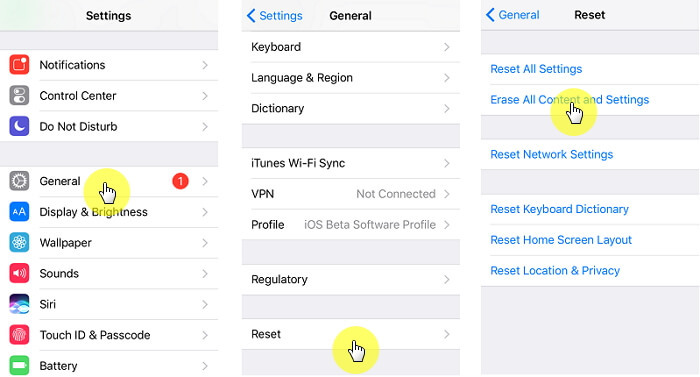 Perform three processes to reset the restriction passcode on iPhone without restoration. Look at the given guidelines if you have forgotten the restriction passcode. 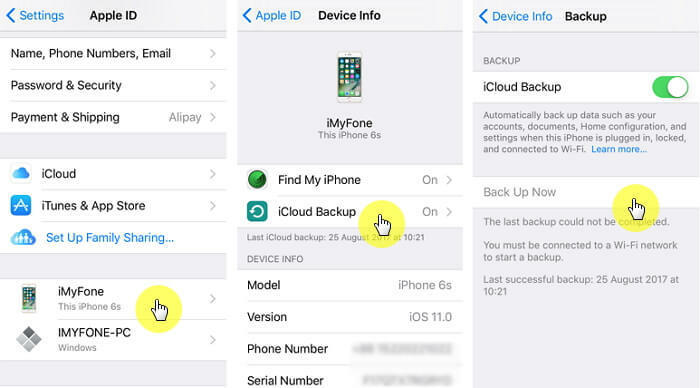 Create a backup to your device: Unlock your device and go to the ‘Settings’ and proceed with the ‘iCloud’ option. From the expanded list you have to turn on the ‘Backup’ in order to create a backup in the iCloud platform. 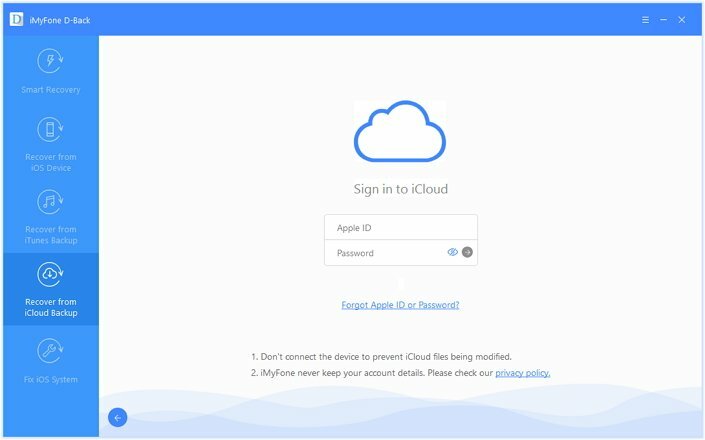 After this process all the data available in the device will be stored in your iCloud account automatically. Unlock your device and go to the ‘Settings’. Select ‘iCloud’ from the displayed list. Click on ‘Find My iPhone’ option and switch off the ‘Find My iPhone’ feature in your device. A popup menu appears immediately prompting to enter the Apple Id password. Enter your credentials and hit the ‘Turn Off’ button to disable it. It is high time to reset your iPhone and so now navigate to ‘Settings -> General -> Reset -> erase all Content and Settings’ in order to reset the iPhone without any data loss. iMyFone D-Back is an amazing software to recover data without any data loss. It supports more than 20 data types. And you can fix all sorts of iOS issues in no time with the help of this effective tool. It is incredible software and satisfies your expectations without any regrets. It adopts 4 types of recovery mode namely iCloud backup, iTunes backup, Recover data from iOS devices and Smart recovery system etc. You can purchase its extended version depending on your needs. 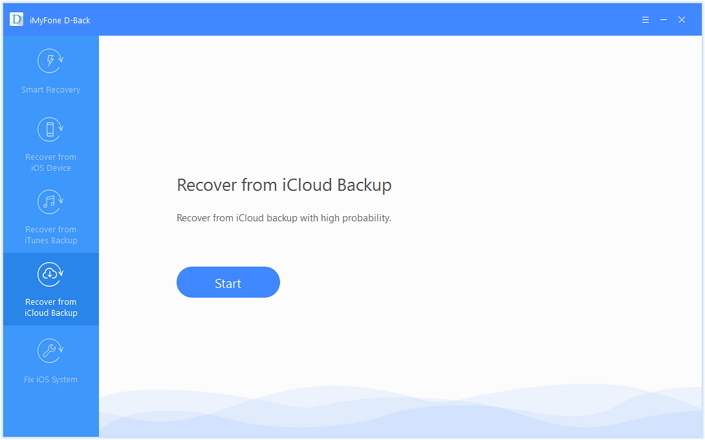 Let us learn how to recover data from iCloud backup with the help of this outstanding software. Step 1: Download iMyFone D-port and install in your device. Launch the tool and select ‘Recover from iCloud backup’ menu from the left panel in your screen. Hit the ‘Start’ button in the right panel of the screen. Step 2: Choose the necessary files that has to be recovered from the backup. 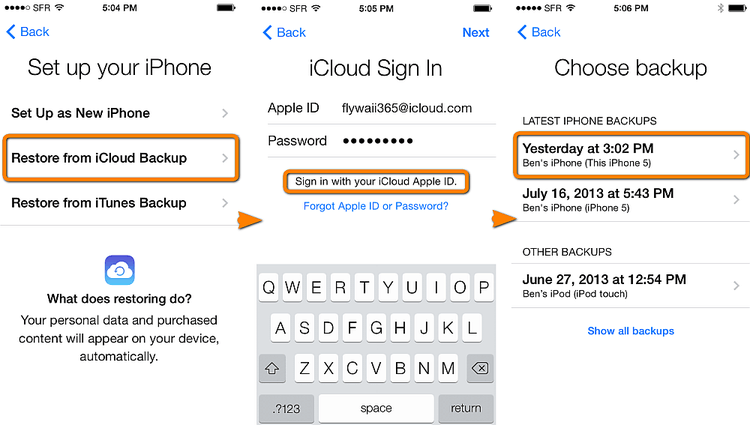 Enter the login Apple id credentials in order to step into the iCloud account. Step 3: Select the necessary files from the displayed list and click ‘Next’ button which is available at the bottom left of the screen to trigger the scanning process. Step 4: Soon after the completion of scanning process make a preview of the selected file and hit ‘Recover’ button in order to download the data from the iCloud backup. 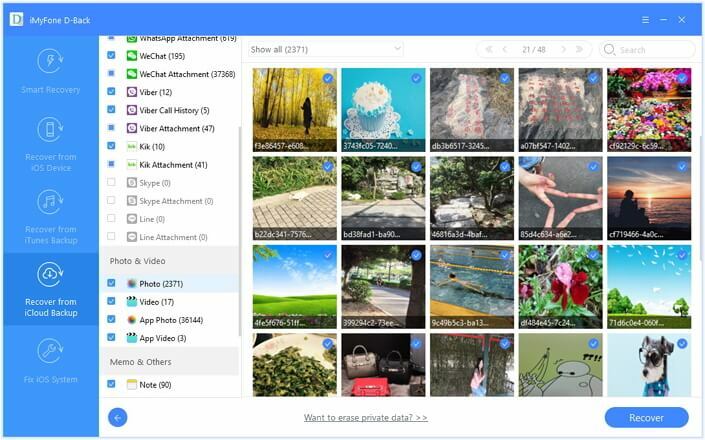 Step 5: Navigate through the folders and allocate appropriate memory space to store the recovered data in your computer.